I am on the Eurostar to Paris sitting next to a group of men travelling together who turn out to be tax inspectors (I get talking to them through the bloke next to me reading Dante’s Divine Comedy). They are off to Italy, to Florence, via Turin where they are due to overnight this evening. I ask them if they will have time to see the Turin Shroud. I am in the Sacre Coeur this same evening. I stop to light a candle in one of the side chapels. On the wall for some reason is an image of the Turin Shroud. I am on the phone on the street in Passy, Paris 16e, greenlighting the latest Real Stories Original, a documentary set in Chicago. I come off the phone and glance across the road – there’s a vintage clothing store called Chicago. The organisation which calls itself The Stop The War Coalition posted this tweet on the night of 13th November 2015 as news of the Islamist terror attacks on Paris spread around the world. Then they deleted the tweet which shows clearly what lies behind this organisation, because they don’t want to be open about their actual views. They don’t want people to know what or who is at their heart but it’s important that it is preserved for posterity so anyone who thinks it’s a benign gathering of pacifists can be disabused. 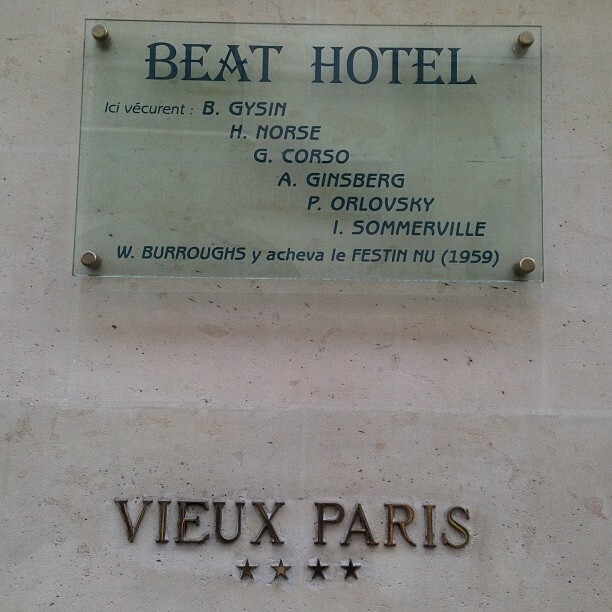 Since I’ve been working so hard on the Ginsberg chapter (my model chapter) it was a real pleasure to go find the Beat Hotel while I was in Paris visiting Arte and my old friend Marcelino Truong (whose current book, Une Si Jolie Petite Guerre, is named after Joan Littlewood’s Oh What a Lovely War). 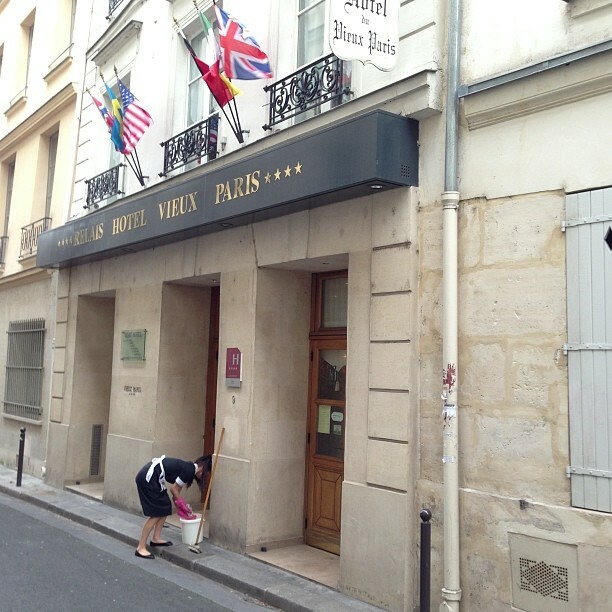 The hotel, where Ginsberg stayed and nearly picked up a drug habit thanks to Burroughs and Corso, is a literal stone’s throw from the Seine by Notre Dame and two blocks from Shakespeare & Co. whose owner, Sylvia Beech, is still on my radar (though a long shot) as a potential case study. The most striking thing for me about Un bar aux Folies-Bergère, the last masterpiece by Édouard Manet, painted in 1882 for exhibition at that year’s Paris Salon, are the green booties. What on earth are they doing up there? What kind of night club were they running? Some wild place that they’ve got trapeze artists flying about overhead and no-one gives a monkey’s – no-one is even bothering to look up at them. Circus Circus 90 years ahead of its time. 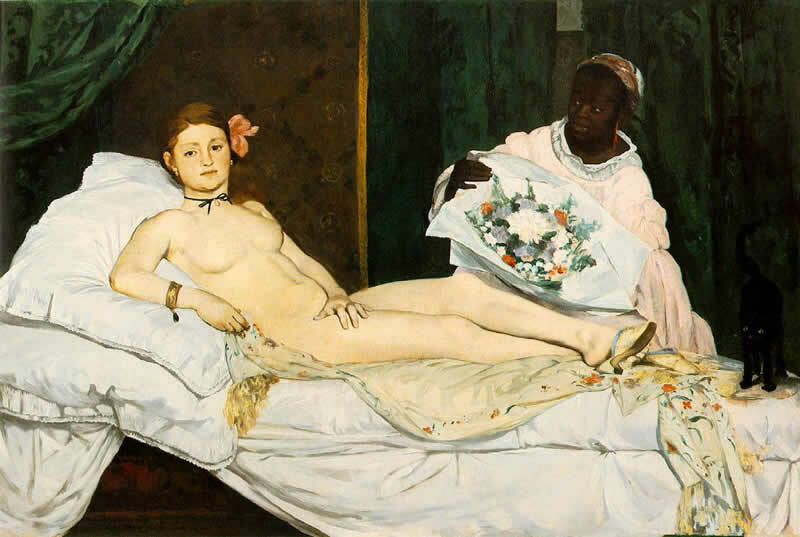 That pair of bright green booties top left and the pink leggings – some kind of surreal joke on the part of M. Manet? Always gets a wry smile out of me. You can see this painting in the Courtauld Collection in London’s Somerset House, London. I’m currently reading Somerset Maugham’s The Razor’s Edge (appears on a lot of people’s Books That Changed My Life list so thought I’d give it a bash) which includes a scene of a visit to the Folies in post-Global Economic Meltdown Europe i.e. the early 30s . It’s in the context of a bit of a night crawl where a bunch of posh folk trawl the nighttown for thrills from the rough. The sense of classes colliding is strong in this picture, questions of power balance looming large. 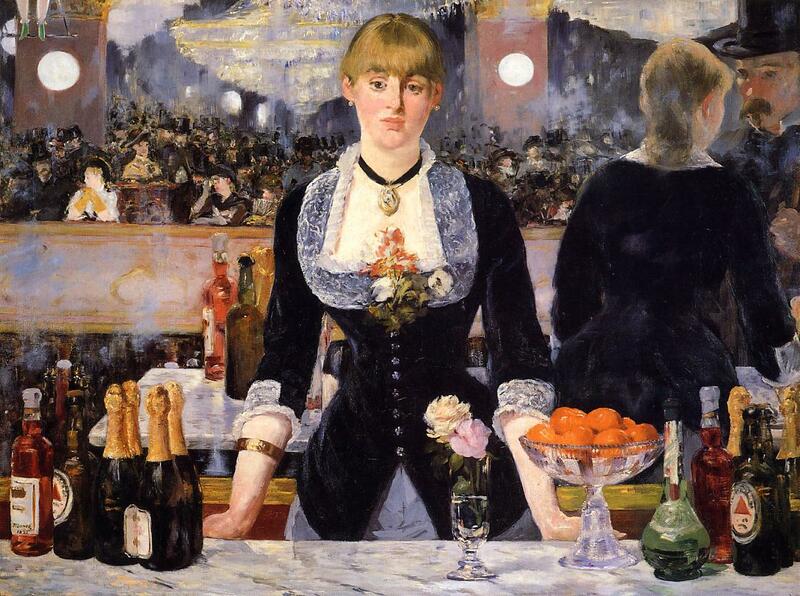 Looking and not looking seems to be a preoccupation of Manet. The barmaid stares straight out at you the viewer – the last of a long line of such enigmatic stares. Olympia gives a challenging enigmatic stare in the eponymous painting [below]. 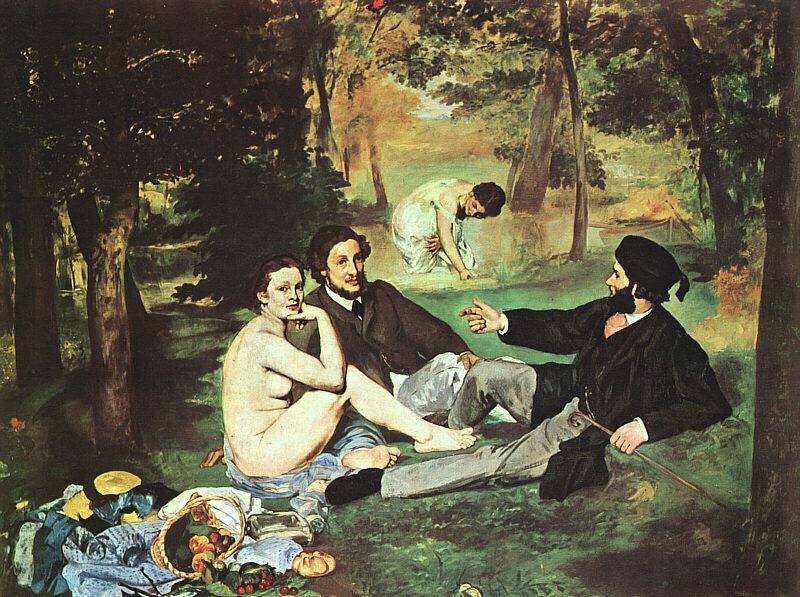 As does that cheeky naked picnicker in Manet’s Dejeuner sur l’Herbe [below] (a quick tribute here to recently, dearly departed Malcolm [McLaren] who had fun with Manet’s woman in his Bow Wow Wow period). 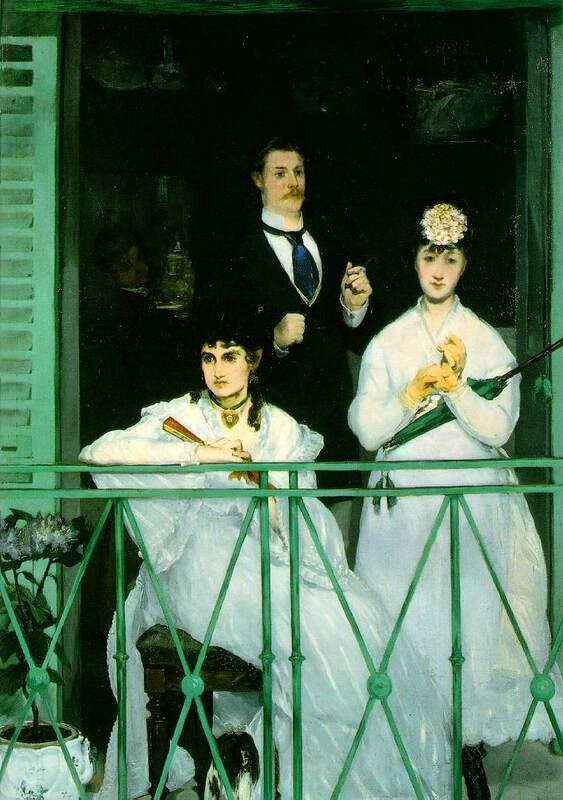 Manet gets his female protagonists to give as good as they get from staring males, no matter how much at a disadvantage they are (e.g. a bit light on the clothes front). Also in common (and common is the operative word – to reiterate, there’s a lot of class stuff going on around here) in common with Olympia is the fact that the barmaid is wearing a black ribbon. Why is Olympia wearing just the ribbon and the odd adornment – a bracelet, a hair ribbon, slippers? The answer can be found in the writing of poet Charles Baudelaire, a contemporary of Manet, just some ten years older – he had a conviction that Nature is much enhanced by Artifice – whether that artifice (Paradis Artificiels) is a ribbon or a reefer doesn’t much matter, it is the contrast which enlivens. The other afternoon I had a fabulous chat over tea with director/writer Peter Kosminsky (Britz, The Government Inspector, Warriors) about a forthcoming scriptwriting project of his. It was refreshing for me because the conversation centred on stories which is not usually the focus of much of my work in the Factual arena. 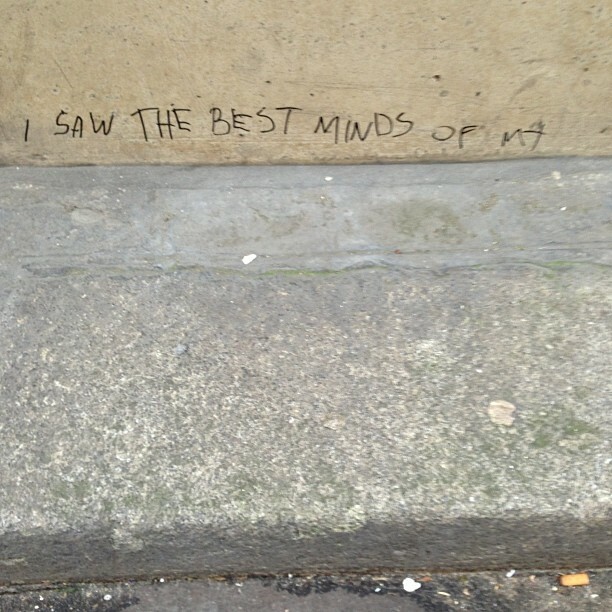 Stories are so fundamental to human culture and I came across the beginnings of a fascinating one today. Like my earlier post Je suis un chef noir – Heart of Darkness, it’s a story involving France and Africa (in this case, indirectly through Afro-America) and racism (in this case, the prejudice of America not of France). The protagonist is Eugene Bullard. The entry point is the Paris jazz scene between the wars. 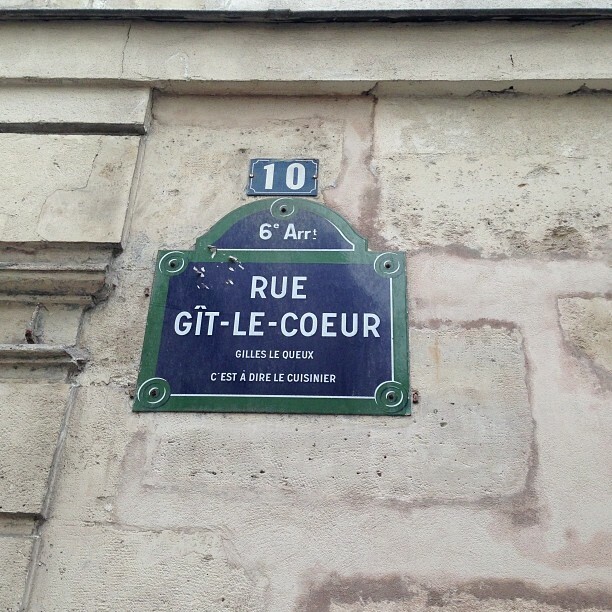 The scene was based in the seedy quarter of Montmartre. Bullard, a black American born in Georgia or Mississippi [depending on what you read] in 1894, was programming Zelli’s Club, one of the key clubs in the area (set up in 1919 or 1922 [depending on what you read] by Joe Zelli, a London restauranteur or an Italian-American [depending on what you read] – guess he could have been both, a restaurant and club which dominated the scene til the 30s. 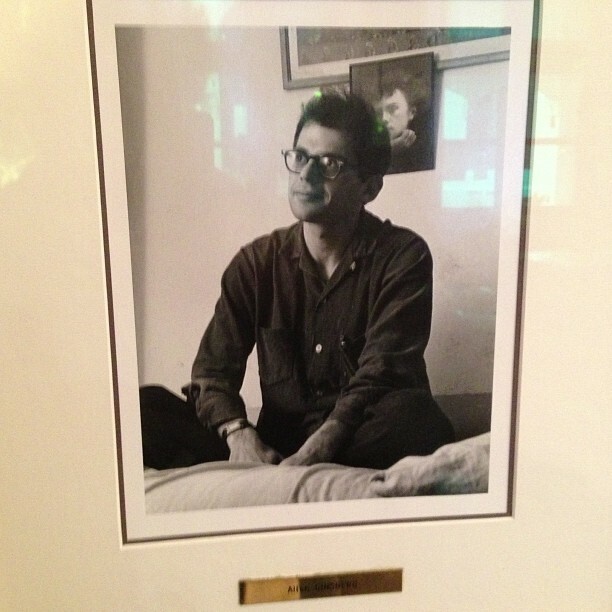 The walls were decorated with movie star caricatures which were later emulated at Sardi’s in New York which is where I’m writing this post [in the city not the restaurant, that is]. I came across this story whilst reading about purposeless wandering around cities and today in my purposeless wandering around Gotham I found myself under the red awning of the Village Vanguard where, for example, John Coltrane played in 1961 – the year Bullard died in this same city. So all the skeins of this narrative have been weaving themselves together all day.) 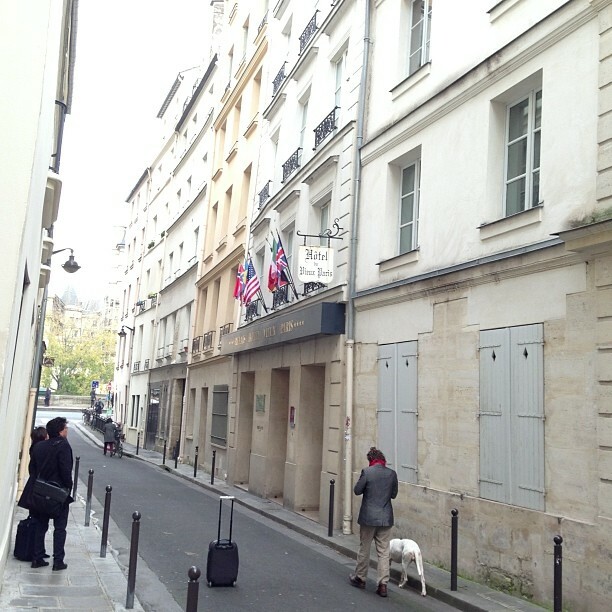 Bullard went on to own another hot jazz club, Le Grand Duc. Zelli’s, with its underground dance hall, was less upmarket than the Duc and regularly raided by les flics. Back as a child in the deep South, Bullard had had explained to him by his father: “in France there are not different white churches and black churches, or white schools and black schools, or white graveyards and black graveyards”. His mother was a Creek Indian which makes the decoration of the biplane, above, all the more resonant. When he was ten, Bullard stowed away on a ship and made first for Berlin or Scotland [depending on what you read], then London (where he was a boxer and music hall performer), reaching Paris in 1913. When the Great War erupted the following year, Bullard joined the French Foreign Legion. He won the Croix de Guerre for his role at the crucial battle of Verdun. 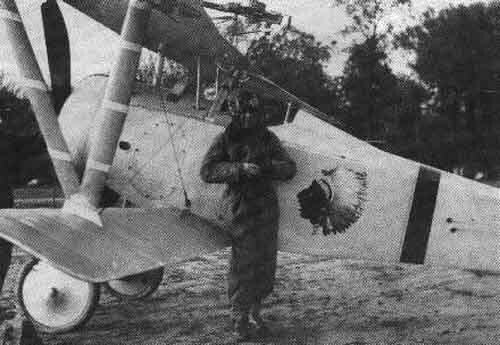 He went on to join the Lafayette Flying Corps, a volunteer squadron who fought for France before America entered the war (the outfit to which the plane above belonged). He flew 20 missions and downed two enemy planes. 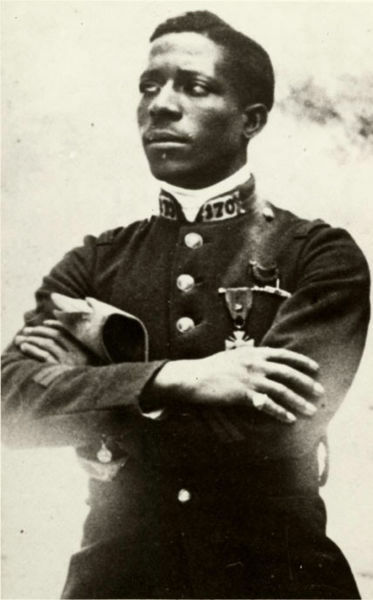 So he was the very first African-American military pilot. His nickname was Black Swallow of Death. When the USA did enter the conflict in 1917, Bullard was transferred to the US Air Force and immediately grounded. He ended up back in the French infantry. He’d literally been “uppity”, thousands of feet uppity in the French skies. Our hero died in poverty and obscurity in New York in 1961, having had a series of non-uppity jobs from perfume salesman to interpreter (for Louis Armstrong) to security guard, ending up as lift operator at the Rockefeller Centre (which I wandered past last night aimlessly). Despite decades of obscure wandering in the aftermath of his Parisian heyday, Bullard was buried with military honours …by French Officers in the French section of the military cemetery in Flushing, Queens, New York. Two years before, the French had made him a Chevalier of the Legion d’Honneur. By contrast, the Americans waited 33 years after his death and 77 years after his pioneering heroism to eventually make him a Second Lieutenant in the United States Air Force. Not the ending the story deserved.